You will be given a reference e-book to read which has 221 pages And the test will be based on that e-book , you can take final test within 1 year of purchase. What is VMware Vsphere 5.5? VMware Vspeher is the virtualization platform formerly known as VMware Infrastructure which is used for cloud computing and virtualization of operating systems. It is the brand name which is used for different products of VMware suite that uses the ESX and ESXi hypervisor. VMware Vspeher started in 2009 with aim of implementing and managing virtual machines on larger scale through any secured remote connectivity. The current version 5.5 is the updated one. Existing applications see it as dedicated resources but servers are managed a pool of resources. So by this way business applications run in a simplified but secure IT environment. It is one of the major and emerging competitor in server virtualization market with Red Hat Enterprise Virtualization, open source Xenhypervisor and Microsoft Windows Server 2012 with Hyper-V.
Enrolling in the VMware Vsphere 5.5 certification course which is developed and is now made available by a highly reputable online certification company called Brainmeasures to the public is probably the best thing that you can do in your attempt to gain a more complete understanding about VMware Vsphere virtualization process. By enrolling in the VMware Vsphere 5.5 course offered by Brainmeasures, you are increasing your chances of strengthening your background about the field. This certification course allows you to undergo a VMware Vsphere 5.5 training which explains in full detail all the major concepts associated to virtualization process of machines and server with distributed environment. Once you finally grab the concepts and process of virtualization at VMware and Vsphere platform, you will no longer have a difficult time impressing the public with your skills after getting the prestigious certification from Brainmeasures. Being an IT expert, virtual system manager, cloud services analyst, cloud services provider, database administrator or such positions you will not only acquire knowledge and expertise of using VMware Vsphere 5.5 efficiently and effectively but this will also cause to increase your earnings depending upon adaptability with requirements and changing environment. The average annual salary for such persons is $98,000 per year which has the multiple potential to increase from that level to $120,000- $150,000 or even beyond based on level of experience of the person, demand of the expertise and reputation of the organization. 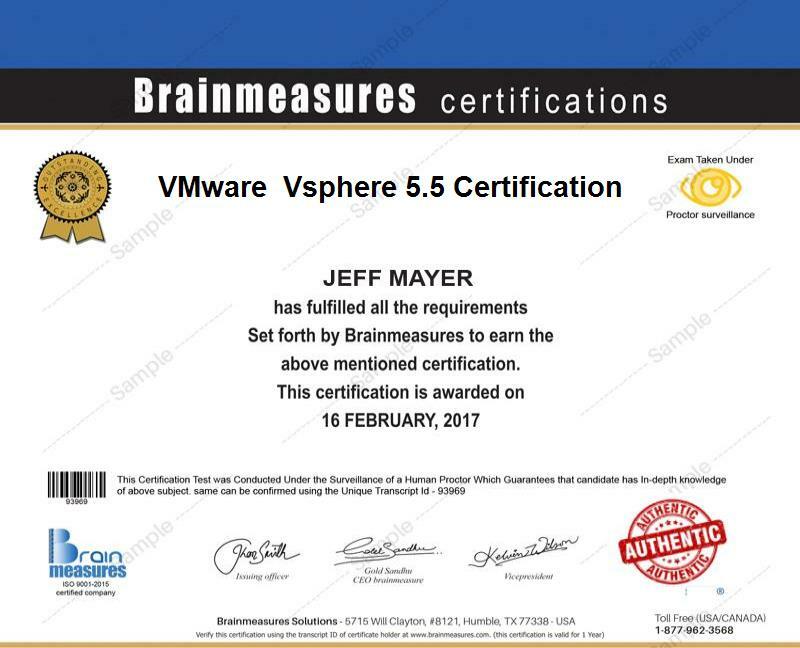 The VMware Vsphere 5.5 certification program from Brainmeasures can benefit business owners or professionals who wish to efficiently handle the data and information with multiple access points as well as to improve the performance of their business through the cloud computing process especially by using mix of public and private but secure infrastructure. This program is perfect for you if you strongly desire to exploit all the benefits that the VMware Vsphere 5.5 can offer. With the help of this program, you will know the basics of using the virtualization process and cloud computing with effective deployment as well as management by using VMware Vsphere 5.5 platform. The program is designed by focusing primarily the requirements of business owners, business executives, IT experts, database administrators, database managers, cloud computing experts, data handlers, data miners, business languages programmers, business reporting analysts, marketing managers and students as well as teachers of computer science, business administration, information management sciences and information technology.